As I near the end of my third trimester, I often get asked “did you have any crazy cravings?” And I can honestly say I never experienced any bizarre cravings. If I watched a food commerical, I would get a craving, like McDonald’s fries or Sprite, but as soon as the commerical ended, the craving would pass. One thing I did experience is my sweet tooth went into overdrive! To help satisfy my insane sweet tooth, I started making banana/chocolate chip muffins, cookies, and bread, etc. This is one of my favorite recipes I made. 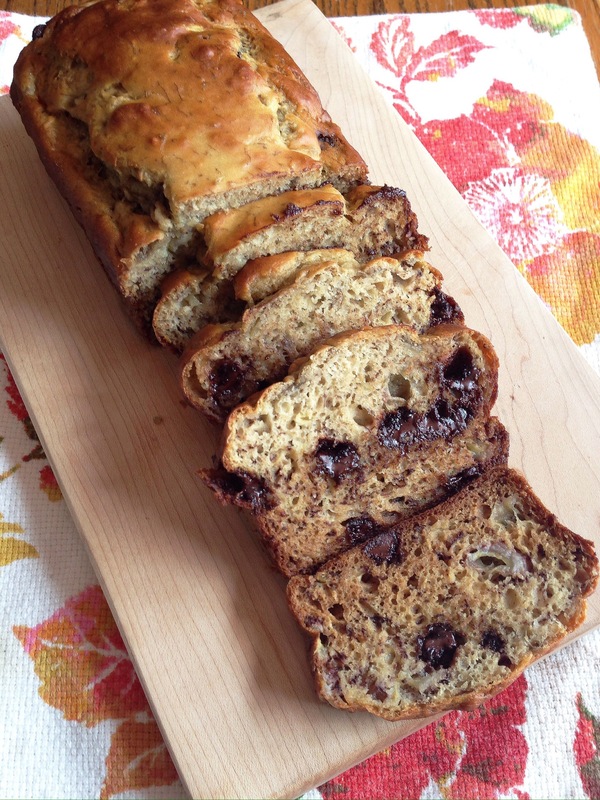 The soft gooey chocolate chips blend perfectly with the moist bread. Some homemade breads can be dry, but this is soft and extra good warmed up with melted butter! Are you drooling yet?